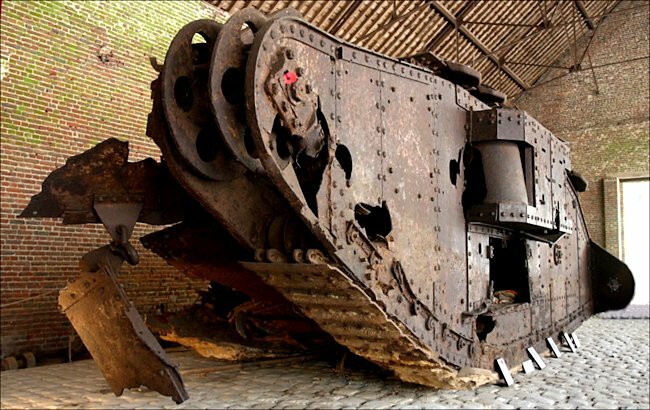 This British Mark IV female tank wreck can be found in a large red brick barn off the road called Rue du Moulin in Flesquieres, south west of the city of Cambrai in northern France. The tank had already seen action in Flanders and was damaged by enemy action. On 22nd August 1917, Deborah D51, was commanded by 2/Lt.George Ranald Macdonald. It was waiting to go into action in the area of Poelcapelle. A German artillery shell damaged one of its tracks. The tank commander was badly wounded and had to be evacuated to hospital. 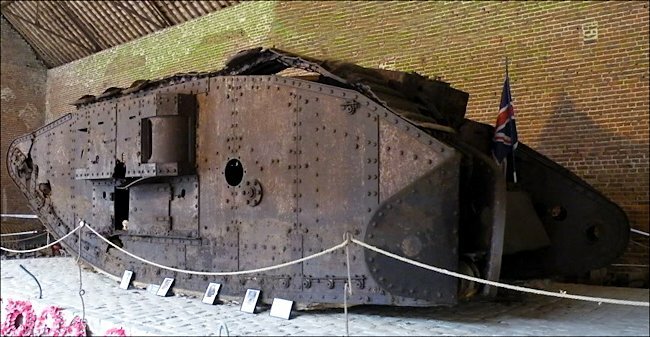 After it was repaired the tank was sent to Ytres by train and it Dorve to the south edge of Havrinvourt Wood to await the start of the Battle of Cambrai. She was to be part of the second wave of tanks tasked with the capture of the Hindenburg support line in the sector west of Flesquieres. 2/Lt. Frank Gustave Heap now had command of D51 Deborah. 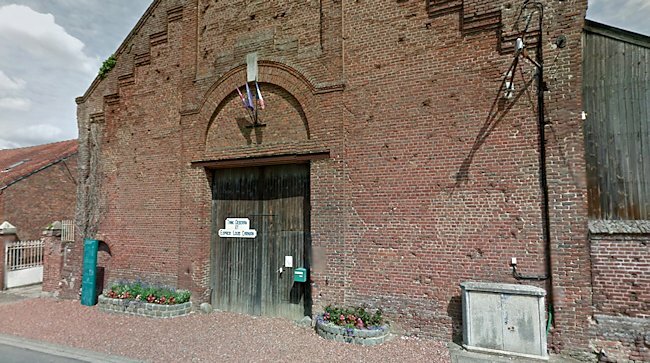 On 20th November 1917 the tank entered the village of Flesquieres but came under fire from a battery of German field guns firing high explosive shells. It received five direct hits. Heap was awarded a Military Cross medal for guiding half his crew to safety after Deborah was knocked out. Lance Cpl G.C.Foot, Gunner J.Cheverton, Gunner William Galway, Private W.G.Robinson and Gunner F.W.Tipping were members of Deborah’s crew and died when she was hit. They are buried in the Flesquieres Hill British Military Cemetery. It is believed she was buried by the British to provide a shelter. After the hole was dug other tanks were used to tow D51 Deborah into position and then she was covered in with the recently removed soil. German prisoners were used to do some of the manual work. The first British tanks went into action only a few at a time: without proper preparation, without recourse to well thought out means of co-operation with artillery, infantry, and cavalry; without adequate reconnaissance of the ground they were to cross: and without a sufficient backing by a workshop maintenance organization. Nothing much was expected from them and very little was accomplished and so it had gone on throughout the best part of 1917 when scattered parties of tanks played minor roles at the Battle of Arras in April, at Messines Ridge in June, and at Gaza in Palestine. In the sodden ground that screened the approaches to the Passchendaele Ridge, tanks used in penny packets wallowed helplessly in the mire, though on the occasions when detailed care was taken to prepare their entry into action, they enjoyed refreshing successes and helped save many infantry lives. Careful preparation was to be the keynote, and from then on the study of aerial photographs, linked with minute examination of the ground over which the tanks had to pass, led to precise directions which told each crew its exact route and task and left as little as possible to chance. Tanks were highly vulnerable to artillery fire, even though the relative inaccuracy of field artillery usually called for an appreciable number of rounds to be fired before they could hope to hit the target. Therefore, while the Germans reckoned to base their anti-tank defence upon artillery fire aimed at tanks that moved slowly through a maze of obstacles and deep trenches, the British and French tried to knock out the artillery by counter-battery bombardment and by attacks from low-flying aircraft. Secrecy linked with surprise in the timing and location of an assault were among the principal advantages made possible by tanks. Most movement, of course, took place on railways, since the range and reliability of the early vehicles made it essential that they should run on their tracks only when absolutely necessary, but by moving at night and hiding during the day, the tanks could be assembled close to the front and remain unnoticed until only a short time before action. Because vision from the early tanks was so restricted, most actions took place by day, and this also allowed the tanks to withdraw for replenishment and repair by night. There were a few attempts at night fighting but these usually ended in chaos and loss. In consequence the German defenders had only to concentrate on defence by day and this they did by moving 77 mm field artillery closer among the front line troops and by encouraging the infantry to attack the tanks with the clumsy and unpopular 13 mm anti-tank rifle, with grenades, and with flamethrowers from close quarters. At Cambrai they also made air attacks on tanks, sometimes with encouraging results. These were the tactics that had evolved by the time of the Battle of Cambrai when, for the first time, infantry were persuaded to work in close accord with the tanks, conceding the dominant role to the latter. Here too, smoke-screens were used as part of the counter-battery programme so that tanks advancing without warning by the half-light of dawn arrived among a confused and partially-blinded enemy. But, as we have seen, although Cambrai was a tank success, it was not total victory. Co-operation between tanks and the cavalry arm of exploitation had not been catered for and the advance fizzled out. The Whippet tank had not yet arrived and so there was no suitable machine to travel with and to help the cavalry. That was all in the future. In the meantime, thoughts of further Allied offensive actions in 1918 had to go into abeyance in response to the great German spring and summer offensives. Lacking tanks of their own, the Germans broke the Allied fronts time and again by the novel but still costly combination of short, violent artillery bombardments aimed at the weakest portions of the Allied line and followed up by infantry who by-passed opposition and drove deep into the Allied rear. To help destroy this offensive, the British tended to scatter their tanks in small groups along the length of the front, hidden away but ready to pounce on the enemy when he passed by, like 'Savage Rabbits', as they were known. The underlying intention was aggressive, as tanks inherently are, but their effect was diluted in the same way as the early attacks had been. Yet tanks claimed their successes, notably those scored by the Whippets with their greater speed. During the German offensive several new facets of armoured warfare were introduced. 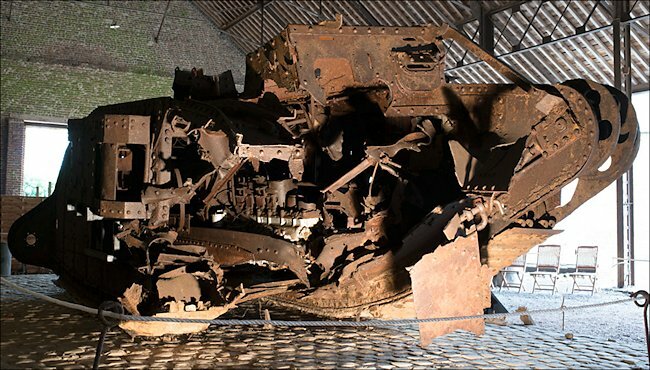 The Germans started using tanks themselves, first of all manning machines that had been captured from the British but later bringing their own A7V Heavy Tank into action until, on 24th April 1918, tank fought tank for the first time at Villers-Bretonneux immediately preceding an action when Whippets charged and played havoc with German infantry. A little later the latest French light tanks, the Renault FT, came into action for the first time and, by weight of numbers as much as anything else, saturated the German defences, for given a mass of small armoured targets to shoot at all at once, the distraction proved too much for the German gunners. By the time the German offensives had been brought to a halt (quite frequently as the result of Allied counterattacks that employed tanks in large numbers) the British and French armies had cleared their minds on the basic principles governing future tank offensives. The Cambrai method to breach the front by the surprise employment of massed tanks along with infantry on a narrow front held good, but it was to be extended to bring in horsed cavalry helped by Whippets, while the presence of such larger numbers of new tanks made possible the preparation of more than one major offensive at once to be launched in close sequence on different parts of the front one after another. In essence, tanks speeded up the whole pace of warfare since they partially replaced artillery and therefore cut down the time needed to prepare for an offensive since there was less need to accumulate as much ammunition as was needed for the prolonged bombardments of old. On the strategic plane a rain of blows, coming one after the other, threw the Germans off balance and, virtually, brought them to the verge of defeat. Tactically, however, there were limitations to success which held deep repercussions for the future. The German tactic of emplacing 77 mm guns close to the front made the tanks pay a heavy price for their gains, even though the help provided by co-operating infantry brought a high mortality rate to the guns. Simultaneously it was discovered that Whippets working alongside cavalry were hardly compatible: when one could go fast the other could not and vice-versa. Indeed, once a breakthrough had been achieved, as at the Battle of Amiens on 8th August 1918, it was Austin armoured cars running free on roads which scored the most resounding successes in exploitation. Possibly one of the most important aids to tactical improvement was the mounting of radio sets in tanks to send reports from the in the rear with unheard of speed. Radio reporting from the front had been almost impossible up to then, which is hardly surprising when it is recalled for instance, that the bulky British set required nine men to carry if along with its heavy batteries. So much for the machines and their impact upon the art of war. Do not forget the men who manned them, and remember the extreme difficulties and dangers under which they worked. The new breed of soldier, the tanker.